A soccer field (sometimes referred to as “the pitch”) is at least 100 yards long, 50 yards wide, and has a goal centered at both ends. 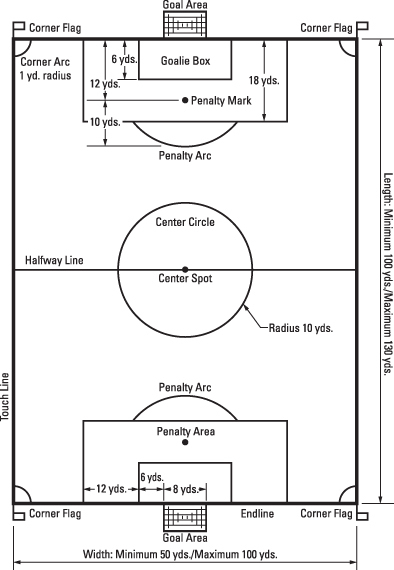 Within the field are markings including those for the penalty area and spot, the center spot for kick-offs, and, of course, the corners — without which corner kicks would just be kicks. The field of play is divided into two halves by the halfway line, which joins the middle of both touchlines. In the middle of this halfway line is the center mark commonly referred to as the center spot. Around it is marked a circle with a 10-yard radius.